Hello my friends. Been busy finishing up our taxes. Just about done. I have taken a few moments, well more like hours to work on a few projects. I had bought this lovely white antique table which has the coolest legs on it. I will have to take pictures of it's legs tommorrow to show you. The narrow tall cupboard behind the table has been my latest project. It was a plain dark stained wainscott cabinet that I have painted white. Still have some painting left on the sides to do yet but I just could not wait and just had to decorate it. 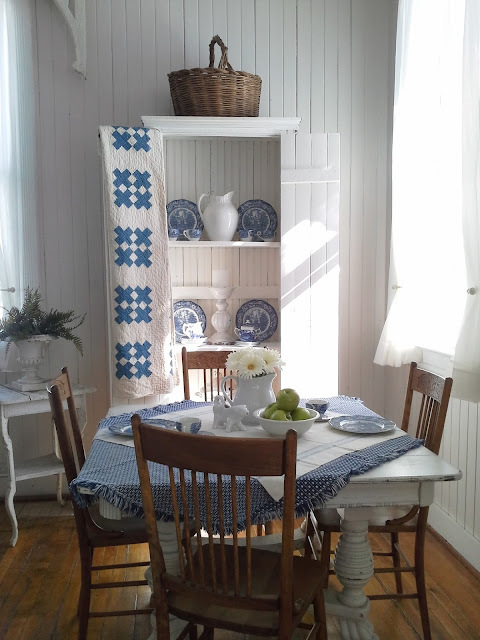 I brang out some of my old blue and white antique dishes, found a couple of table cloths that I layered on the table and vula...a perfect setting for a meal. Hope you like it. Have a wonderful weekend. The old cabinet looks wonderful. Nice size too, not too wide. I have been looking for one like it. It looks so fresh and pretty! Very spring-like. What a bright airy room. I love the blue and white mixed with the natural wood. Gorgeous! I found you through Cozy Little House and I am your newest follower. Oh, I love everything about this room. I just love the blue and white. If and when I switch up all my colors I am leaning towards this! Just soothing and pretty! So glad I found you at "Cozy Little house." I am new follower! I love the freshness of this room ! I'm following now , came over from Welcome Wagon Friday at Cozy Little House .Come visit sometime . Love your blog and your living space is just perfect. The blue and white quilt really got me hooked. I found you today through Brenda. I am your newest follower and would love for you to come by my place. I also do a monthly post over at Brenda's. Have a lovely evening. Love your blog. Coming over from Cozy Little House. So pretty. I've always loved blue and white. It really puts me in the mood for summer! Visiting from Cozy Little House (Brenda's). Love your painting and decorations and am following so I remember to visit again. Great cabinet in the dining room. 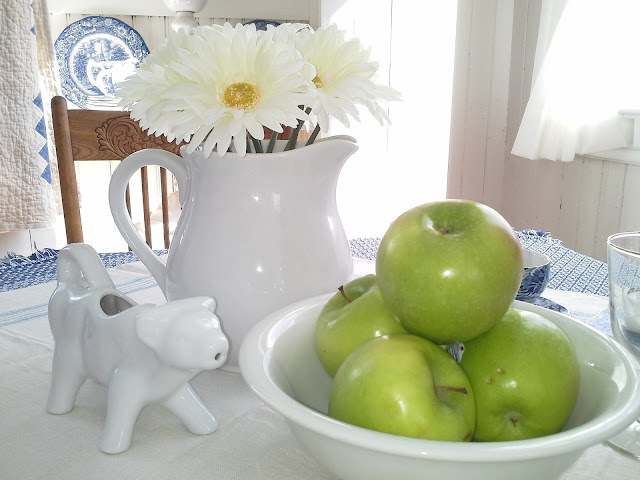 Visiting from Cozy Little House Welcome Wagon...love your dining room! My favorite decorating colors. Found you this morning through Cozy Little House. 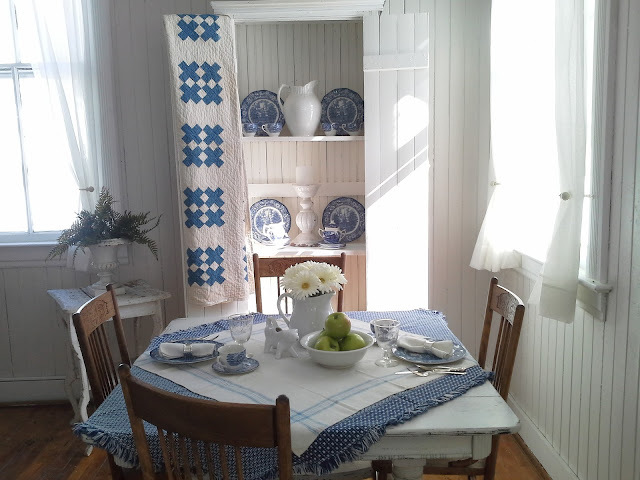 Your room is so lovely - can't go wrong with blue and white. My fav is the quilt. This a very nice dining room. I love how light it is and how you added touches of colour. Hello, I live near Versailles in France and my english is so bad. But, I like your blog and your so white home with a touche of blue.